Trim silver skin or connective tissue off tenderloins with a very sharp thin knife. Place tender loins on a nonstick cookie sheet with a rim. 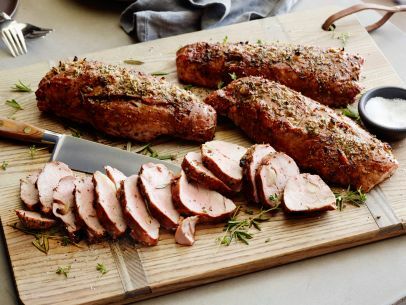 Coat tenderloins in a few tablespoons of balsamic vinegar, rubbing vinegar into meat. Drizzle tenderloins with extra-virgin olive oil, just enough to coat. Cut small slits into meat and disperse chunks of cracked garlic cloves into meat. Combine steak seasoning blend or coarse salt and pepper with rosemary and thyme and rub meat with blend. Roast in hot oven 20 minutes. Let meat rest, transfer to a carving board, slice and serve.